Winner of the 1994 Heisman Trophy after rushing for 2055 yards as a junior, Salaam chose to enter the ’95 NFL draft and was taken by the Bears in the first round (21st overall). Slow to get on track after a contract holdout that extended into training camp, he took over as the team’s feature back after RB Raymont Harris was lost to a broken collarbone in the season-opening game. Bears went 9-7 to finish third in the NFC Central. The solid rookie season proved to be by far the best of Salaam’s career. 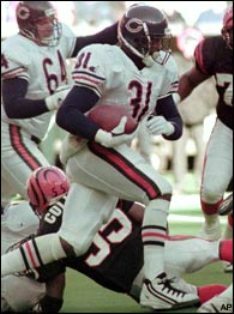 He gained just 496 rushing yards in an injury-plagued 1996 season and 112 yards in three games in ’97 before being cut by the Bears. He appeared in two games for the Cleveland Browns in 1999 and also had a short stint with the Memphis Maniax of the XFL in 2001 (525 yards in 6 games). Overall, he gained just 610 more rushing yards and scored four more TDs in his abbreviated NFL career after his rookie year, a victim of injuries and poor work ethic.